The NASA Goddard TRANSFORMERS OPTIMUS PRIME Spinoff Challenge, hosted by the Innovative Technology Partnerships Office (ITPO) at NASA’s Goddard Space Flight Center in Greenbelt, Maryland, is launching its 2014-2015 academic year competition. 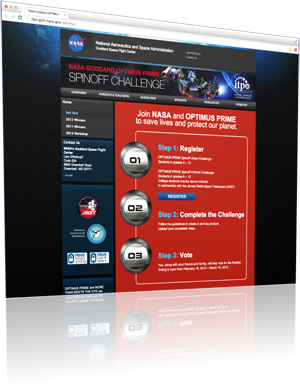 The purpose of the challenge is to raise awareness of NASA’s Technology Transfer Program and to inspire interest in all NASA missions, programs and projects. This year the scope of the contest is being expanded to include two challenges. The first challenge is very similar to previous years’ contests. Students in grades 3 through 12 are asked to submit a video describing their favorite NASA Goddard spinoff. In a new twist, participants in this year’s contest must also use the engineering design process to develop and propose a new spinoff application of their own for the technology. Spinoffs are technologies originally created for space and modified into everyday products used on Earth. Examples include memory foam, invisible braces and scratch-resistant lenses for eyeglasses. A second Spinoff Challenge, the TRANSFORMERS OPTIMUS PRIME InWorld Challenge, offers students in grades 6-12 an opportunity to take their video spinoff ideas to another level. Interested teams must study James Webb Space Telescope spinoff technology and post their completed spinoff videos for review by college engineering students. Engineering college mentors will select 20 teams to continue the collaborative design process within a multi-user virtual world to build a 3-D model of the team’s design solutions. This is the fourth year ITPO has collaborated with Hasbro on the challenge. “We are pleased that Hasbro and the Transformers brand are able to support the promotion of the many disciplines of science, technology, engineering and math (STEM) to students,” said Sarah Carroll, Senior Brand Manager, Hasbro TRANSFORMERS. Winning students from each grade category will be invited to Goddard to participate in a behind-the-scenes workshop and VIP awards ceremony. One special attendee will be the voice of OPTIMUS PRIME, actor Peter Cullen. OPTIMUS PRIME and TRANSFORMERS are trademarks of Hasbro and are used with permission. ©2014 Hasbro. All Rights Reserved.